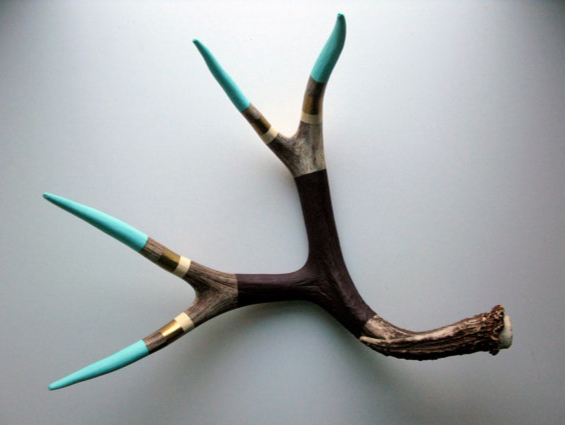 I am loving these painted antlers from MadebyCassandraSmith on Etsy. The pop of color and metallic paint give this otherwise already great addition to a vignette or bookshelf that much cooler. Could make a fun gift for someone that loves unique pieces for their place. Or just for you to enjoy on top of your favorite collection of vintage books. For those DIY'ers, with some paint, painters tape and a little time, this could easily be done by you. Great way to create a fun project with a flea market find. PS: They are all "naturally shed" antlers, so no worries on where they came from.